The Triad "Zhong Xin Yi" is a well-established gang, and under superb management of their leader Lin Ho Lung (Sammo Hung), has many followers. Ho Lung? wife Soso (Tien Niu), his brother Lin Ho Tung (Simon Yam) as well as his followers were all very loyal and helpful to him. Hence, the gang dominates the Hong Kong? triad world. Once, their three billion illegal business got busted, in addition to the kidnapping of one of their leaders, "Zhong Xin Yi" has since tread onto the route of disaster? 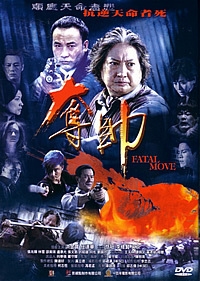 Written and directed by Dennis Law, Fatal Move was originally conceived as the prequel/sequel to 2005's SPL, which had Donnie Yen and Simon Yam pit their skills on the side of the law against triad members played by Sammo Hung and Wu Jing. SPL had an interesting concept to begin with, but I guess with the ending as it was (a cop out in my opinion), a successful sequel with an interlocking storyline with the surviving characters would prove challenging. A prequel on the other hand might not be as engaging, as if we were to see the rise of Sammo's character to triad boss status, it would ring too much a bell with Infernal Affairs 2.
else, a cop yet again. The storyline is nothing to bowl over, and most times seemed to be running on a railway track, completely fixed and one-way, chugging along almost endlessly, without a destination in sight. Character motivations were unclear, and Tien Niu as Lung's wife Soso really let it all rip in a melodramatic monologue that contains a lot more story in her words than all the dialogue put together in the movie. It's about the self-destruction of a triad gang from internal strife from the greed of man, but its central theme was touched upon in a rather haphazard, messy manner that you'd wonder if the sub-plots were just bookends for the action sequences. However, despite its title, Fatal Move is severely lacking in compelling action scenes. You have the tired car chases, and it seems that there was little effort in trying to milk what Wu Jing and Sammo Hung could do. They're martial arts exponents, but get to handle guns most of the time, and this does not exploit the skills they are trained with, which you can probably employ anyone to take over their place. Most of the fighting sequences were courtesy of Wu Jing, who's especially mean with his lopsided blue-dyed hairdo and an extremely sharp sword, but given no competent exponent character-wise to spar with him, it all boiled down to a one-sided affair. Seriously I'm a fan of his and I think it's about high time he takes over the starring role mantle for Chinese action movie stars, instead of getting bogged down playing side show villains. What gets compensated for the uninspiring action sequences, was blood and gore done in CGI. I'm placing my bets that Herman Yau, as director of photography here, would have added some of his own pointers in this aspect, and the camera does linger on in some of the more violent and gory aspects, such as pumping continuous lead into a body, and various forms of decapitations involving limbs and fingers, right down to a castration. The much touted fight between Sammo Hung and Wu Jing was the main draw for me I have to admit, but if you were to put SPL and this side by side, Wu Jing vs Donnie Yen had a lot more intensity and slick moves compared to Wu Jing vs Sammo Hung. But alas despite the M18 rating in its theatrical release, the movie was still subjected to multiple edits and most of the gory bits couldn't escape the censor's scissors. What made it unforgivable, was that the much awaited duel too became victim, and for that, with the insipid storyline and relatively generic action. While the DVD is still given the same rating, the duration of the snips seemed a little lax, though still detectable that the scissors was still at work. Nil, unless you count Kelvin Tong's Rule #1 Trailer which auto plays when you pop the disc into the player. Decent transfer, though not the best. There are a few irks here. First of all, the subtitles, available in English and Chinese, are burned in. And you can spot a few grammatical and typographical errors too. Next, I'm still perplexed why a movie like this had to be presented in 4x3 Full Screen. In doing so, the much touted duel loses its cinematic energy, and you'll feel short changed because either you see one half of each exponent in the numerous medium-shots, or you see only one of them fighting phantoms. Should have gone with the widescreen anamorphic format so that the probable saving grace and talked about last scene, can be witnessed in its full glory.